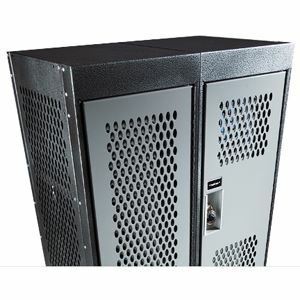 Heavy-duty components integrated with Hadrians trouble-free and rugged design create an athletic locker that will withstand the rigorous demands of sporting facilities. With fully ventilated doors and sides, Gladiator athletic lockers allow for increased airflowan absolute must for serious sporting environments. The rigid door construction in Gladiator lockers make them the quietest athletic lockers available. Doors feature a full 1 (25 mm) thick double pan box design (16-gauge outer / 18-gauge inner) for outstanding rigidity and durability. Fully ventilated doors and sides with 0.5 x 1 (13 mm x 25 mm) oval perforations allow for maximum air circulation as well as visual access. Hadrians rigid double pan construction provides the quietest possible door closing for athletic lockers. Hadrians Gladiators minimize concerns about latching failures in rough athletic environments. No moving parts results in safe, secure and maintenance-free operation. This durable continuous hinge is a standard feature on all Gladiator lockers. Outperforms knuckle hinge designs by resisting abuse and keeping the door in an adjusted position. Exposed ends are available as solid or perforated. Gladiators have the same durable, thick and even powder coated finish as Emperor lockers with the same wide array of cutting edge colors.